My Dad’s eyes tilted slightly higher and his voice took on a reverent, mysterious tone when he said the name of the place. Dad had a way of describing things that made them seem magical. Sometimes, he could impart that mystical quality simply by saying the name – with a certain inflection and a particular combination of body language and tone that made the hairs stand up on the back of your neck. And, you knew that he was telling you about something special, something rare and unique, something that you might remember for the rest of your life. I was eight years old and it was the summer after the second grade. We had just celebrated my little brother’s first birthday on the East side of Vancouver Island at a place called Qualicum Beach – a place where the tide seemed to go out for miles, and you could wade almost out of sight from shore while still standing in water that came only to your knees. 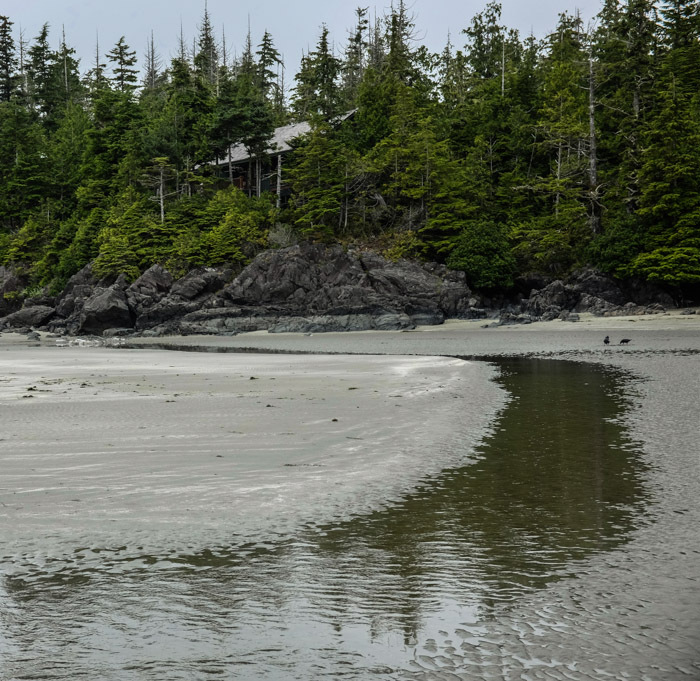 Now, we were across on the West side of the island at Tofino – which seemed to me like the boonies of the boonies. Our family was on an extended summer vacation in our slide-in pickup camper. We had left our home in desolate Denver City, Texas about four weeks earlier on what was, to eight-year-old me, the absolute adventure of a lifetime. Growing up in Denver City, I never saw mountains, or even hills. We had no lakes, streams, or creeks. There were no trees – except a few small cottonwoods planted in people’s yards. At the edge of our tiny town you could see forever – over a barren, wind-blown, treeless, dusty landscape with a vast horizon dotted only by the occasional windmill or pump jack. Summers were blistering hot, winters were freezing cold, and all of the seasons were windy and dusty. For me, the multi-week camping trip to Canada was an experience on par with a trip to Mars. Everything I had seen on our remarkable journey – mountains, streams, lakes, rivers, trees, beaches, rocky coastlines, geysers, volcanoes, wildlife – was so far outside my young frame of reference that I would have been no more impressed had I been suddenly been dropped onto the surface of some alien planet. We had left the dusty high plains of Texas and traversed the rocky mountains, entered into a foreign country, boarded a ship, and landed on an amazing island. We had traveled for weeks and it seemed to me that we were about as far from home as one could possibly be. My Dad was most certainly NOT waiting for the road to improve. We filled our fresh water tank, topped up the main and auxiliary tanks with gas (as well as the secret auxiliary-auxiliary 10-gallon tank my Dad had scrounged from a junkyard Corvair) – and headed down the four-hour dirt-and-gravel road across Vancouver Island to Tofino. That’s how we got to the boonies-of-the-boonies. Now, here at the edge of the world, someone had told us about a hike to a secret beach – a beach where there was no sand, but only finely-ground seashells – a beach that was accessible only by a long and treacherous hiking path. This was the boonies-of-the-boonies-of-the-boonies. We had gone off the grid, and then gone some more. And now we were headed off of the off-the-grid grid. My eight-year-old mind struggled to even grasp the concept. We were going to a place farther from Denver City than I had ever imagined possible. My Dad was an intimidating figure – 5’11” 250 lbs – enormous muscular arms built (he said) from working on the oil pipelines as a teenager. His personality was even larger. He was a high-school band director, and he had the ability to tame over two-hundred teenagers at once with only the sound of his voice. His larger-than-life presence could simultaneously induce fear, admiration, and respect. He could walk into any room and everyone’s attention went to him automatically. My Dad picked up my newly-one-year-old brother in one giant hand and we set out to find… SHELLL Beach. We were traveling with another family – who had their own camper and kids – and all of us were geared up and ready for the expedition. After a bit of easy hiking down a “normal” beach, we came to a place where there were two options: an overland trail through the woods, and a seaside trail that scaled the rocky cliffs above the breaking waves. Mom (and most of the family we were traveling with) opted for the through-the-woods route. Dad, Chuck (the other dad) and I – all went along the ocean route. Since my little brother was sometimes a handful, Dad decided just to carry him. It was harrowing. Dad had a bit of flair for the dramatic in his storytelling. 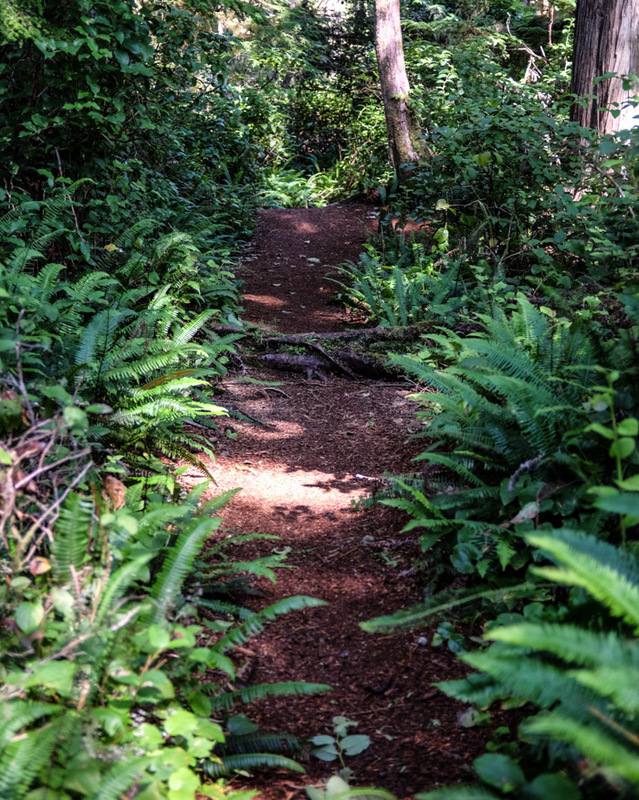 It was also on this hike to … SHELLLL Beach… that Dad took “The Photograph”. He was a photography buff. Even with our schoolteacher budget, he had a pro-level SLR, and a set of high-quality lenses. He had practically memorized the past year’s issues of all of the popular photography magazines. He took slides (and slides only – my goodness, print film is for AMATEURS! ), and Mom maintained our beautifully-organized collection of Kodak Carousel slide trays that spanned our entire family history. From birthdays to band contests to Christmases to vacations – and around the calendar for another loop, the slides chronicled our family’s life from before I was born until after both my brother and I had left home for good. Many of the photos were amazing. Mom and Dad had both done some spectacular work for amateur photographers. But here, at …SHELLLL Beach…, Dad captured “The Photograph” – the one that was to be forever etched in family lore as the best photo ever made by any of us. Three-year-old Dianne, the daughter of the family that we were traveling with, was sitting on the jagged rocks by the ocean. Behind her, the fog had created a murky-mysterious gray that melded with the harsh brown texture of the rocks. She was wearing a bright yellow jacket which – with her almost-white hair – made her look absolutely angelic sitting near the edge of the craggy cliff in the golden-hour light. From that day forward, any time we were having slide-show night at our house, we would all silently wait in anticipation for the time when carousel number 43, slide 15 would drop into the projector to reveal “The Photograph.” Most of us were looking away from the screen, watching the faces of our guests for the predictable “OOOOohhhhhhhhh” reaction that inevitably occurred when the click-clunk-whirrrr of the carousel projector signaled that the cute photo of Craig feeding the chipmunk was about to give way to… aesthetic bliss. My Dad died in 1993. Now, 45 years after that hike, Laura and I are camped in Tofino in our Airstream. The road here is still tricky, but nicely paved and well-traveled. 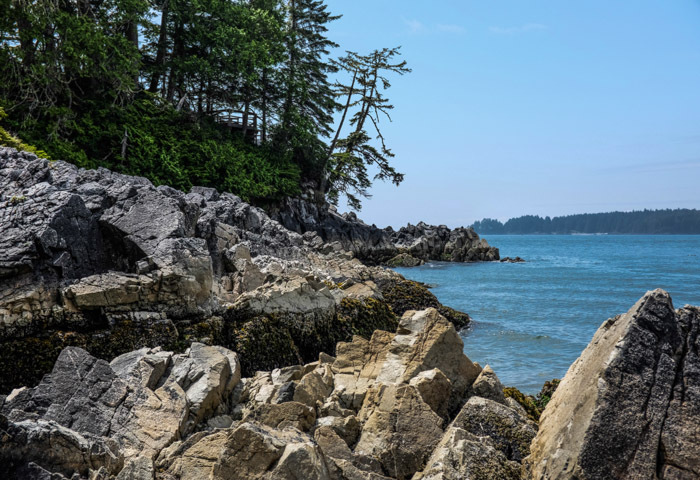 Tofino is no longer an outpost inhabited by just a few hearty souls. It is a popular surfing destination, with a number of upscale resorts, tourist attractions, restaurants, and vacation properties. It still manages to retain a great deal of its charm – despite five decades of development. I wanted to find Shell Beach again. I wanted to hike along the rocky cliffs. I wanted to see the beach made only of shells. I wanted to see the place where “The Photograph” was taken – so indelibly engraved in my memory of nearly five decades. SHELLLL Beach… isn’t on any of the local tourist maps. It isn’t included on any of the signs for “beach access” for any of the numerous local waysides. 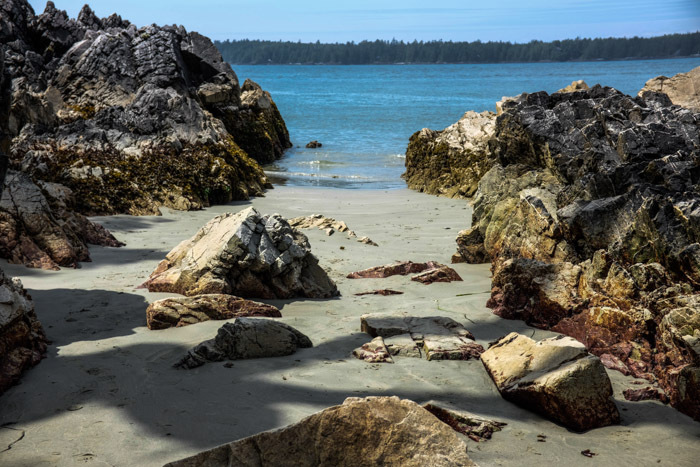 I Googled, Mapped, Foursquared, Travelocitized, Yelped… I found only a handful of semi-obscure references to a “Shell Beach” near Tofino. On Foursquare, I was able to see that a few people had actually “checked in” there, and had thoughtfully left a set of GPS coordinates. I moved those into Google Maps, asked for directions, and our quest began. We parked at a beach access that appeared to be nearest the GPS coordinates. We walked up the beach until the shore would permit passage no more. On the left, there were sheer rocky cliffs interrupted by deep seawater-filled chasms. They were not passable. On the right – there was a beautiful new upscale resort/hotel/restaurant complex. We looked in vain for an offshore route around the hotel that would take us there. We ended up at the boundary of a private residence. We could go no farther. Next, we drove around to the closest road access on the other side – which, ironically, turned out to be the same beach where we were camped. We walked all the way to the end of the beach, but were turned back when a through-the-woods trail turned out to be blocked by a giant swamp. Finally, we worked our way around the seaside route – scaling the steep rocky cliffs with the tide coming in and huge waves breaking below us. I imagined my mother – forty-five years ago – taking that first trail and meeting us on the other side, at …SHELLL Beach. As Laura and I climbed over the challenging rocky route above the ocean, I pictured Dad with my baby brother in one hand, gripping the rocks with the other, slowly scaling the path around the point – determined not to let the rocks, the ocean, or the gymnastics of an over-excited one-year-old deter him from his quest. On the internet, I saw a reference to a couple getting married recently on Shell Beach. There were a couple of nice photos of the bride and groom kissing near some rocks. There is magic in the places we visit. But that magic is created by a non-reproducible combination of the time, the place, our life experience, and the people we share it with. When you return, even if the place is the same, the magic may be gone – or it may live only in your memory. But, I do. I remember it – and I went back to that place today. And, I think I could still hear Dad’s laugh somewhere out there in the waves.